While reading my Placid race report, Dave looked at one of the biking pictures and commented that my position looked good. Because I'm me (and because I'm either in workout clothes or in work clothes but looking haggard by the end of the day and never look nice anyways), I took this as a higher compliment than anything else he could say about my outward appearance. It made me think though-my bike position and setup has come a LONG way, and it's been the source of a good amount of entertainment (and disdain) throughout the years. So, without further ado, here's some pictorial evidence of how far I've come. Yikes. 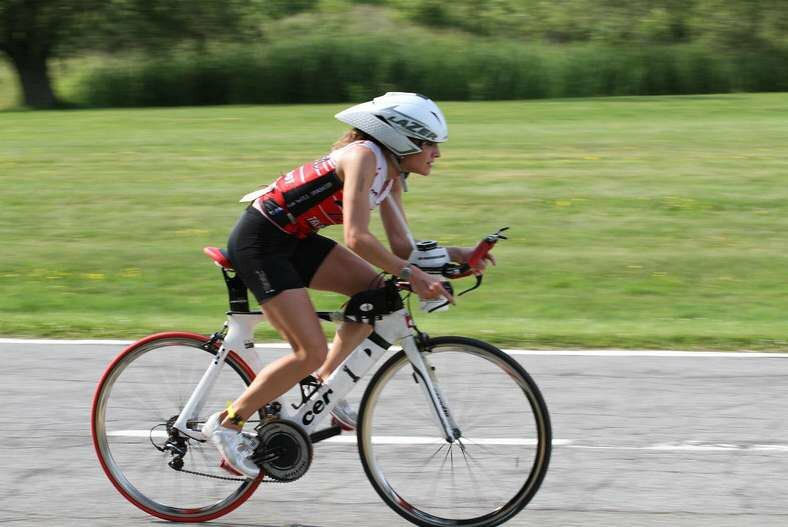 Finger lakes triathlon, 2009. Not the clearest picture ever, but the only thing I could dredge up. 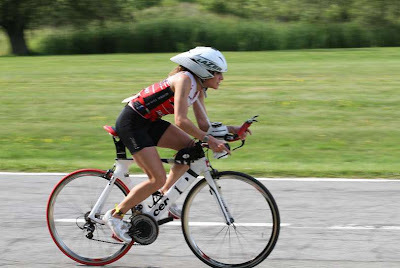 I'm going to cut myself a little slack here, as it was my first ever triathlon, and I'd figured out how to operate the front derailleur the day before the race (before this summer, my bikes had consisted of a 3 speeder with coaster brakes and a garage sale hybrid from Walmart that probably weighed 75lbs). Obviously, we shouldn't expect any miracles from my position. And actually, I'm on a road bike, so the position is pretty reasonable. What's not reasonable is everything else that's going on. What isn't clear in the picture is all of the wires and twist ties that were going on with that bike computer (I remember that they were there). I also know that there's a bottle cage on the downtube (ok) with a bottle in it (ok) that was strictly for show, because I couldn't get to it while riding at the time (or for the next 3 years-not ok). I figured if I got too thirsty, I could just pull over and stop and drink from it. 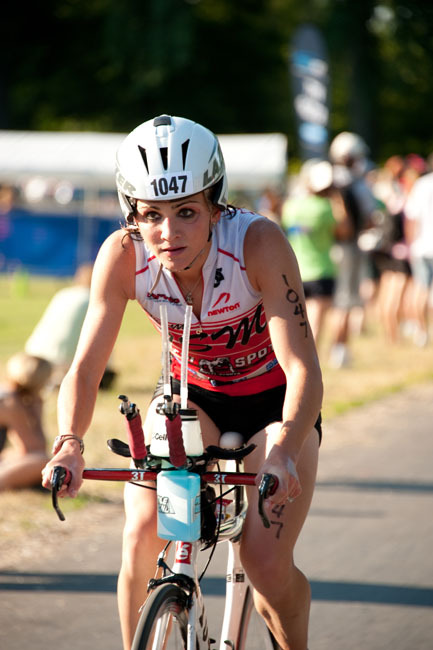 In an Olympic tri. This never happened, so I just went the entire time without drinking. Also, let's look at my getup here. I've got a sweet Walmart helmet on, and it was a little chilly that morning, so I decided to pack the largest tech T that I owned to pull on in transition. Nice sail there, Jennie. We've moved to 2010 now, to the year of my "aero road bike" setup. What that means is that I made Dave buy me clip on aerobars. Their main purpose ended up being a water bottle holder, because I never actually used them to ride in aero. As you can see, I skillfully attached the massive double cell bottle in there horizontally and held it in place with rubber bands at a really awkward angle. That alone would be enough for this picture...but wait! What is that sneaking in over my left shoulder, otherwise concealed by my 15 tons of hair? Why yes, it is a Camelbak tube. I rocked that Camelbak in my first half iron. At least I had a good run...? Later in the season. At least the water bottle is straight. Aerobars still aren't getting any love. Early 2011. 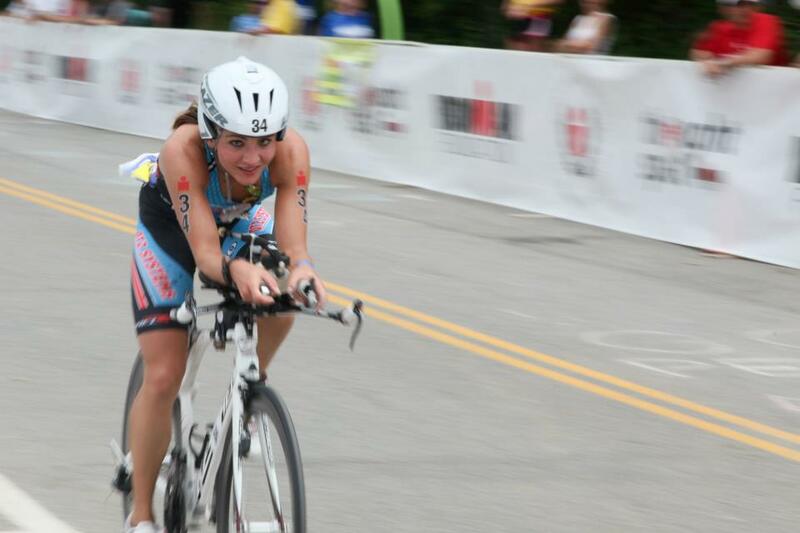 By now, I've graduated to a tri bike. However, I'm still scared to ride it in aero, so I'm in what I liked to term "half-aero". This was an Olympic distance tri, so at least my hydration setup isn't too atrocious-front small aero bottle. You'll notice there still isn't a bottle in my downtube bottle cage. Nope, still can't get at it-saved that for my flat kit. Shortly after this picture was taken, I finally succumbed to aero for the first time-the only positive that came out of this particular race! Musselman 2011. By this time, I'm finally in the aerobars. Good job Jennie! I've also got a race wheel on. You'll notice, though, that I didn't say that I'm in aero, because this is quite possibly the most non-aero aero on the planet. I look like I'm sitting up. My helmet is slightly crooked, so that epidemic had started by this point. But the real focus of this picture should be my hydration setup. That's right, the real bottle cage still has a flat kit taped in it (still can't get to that), with my friend the 40oz double cell bottle in between the bars and the true champion of the picture, a 64oz Neverreach attached to the back of my seat. I think I was contemplating if I still needed the Camelbak before the race. Dear Lord. 2011 Jennie, please go learn how to do a bottle handoff. As a side note, I secured my pro card with this exact setup in a couple months later Vegas. If you biked faster than 2:37 that day...breathe a sigh of relief. If you didn't...keep this image in your head the next time you ride, because it outbiked you that day. The one positive of these pictures is how skinny I was at the time. Thank you, month long stomach thing that ruined my appetite and made it physically impossible for me to eat large meals. Don't I look totally pro here? Start of the 2012 season here-aka, before I horrified Jesse for the first time, leading to him running his first round of Jennie bike interference. I still couldn't get to that bottle cage, bottle handoffs were just out of the question, and I was starting off the season at a hot race-so, I saw nothing wrong with the front aero bottle (smaller but still flailing sideways), the giant downtube speedfil, and the rear xlab to hold another bottle (which I was doubtful that I could reach anyways) with my flat kit in it. Oh, and my aero is still totally unaero. I did try to wear sunglasses here to look a little more official, but they weren't helping much. Conversation after this race included "your watts and speed completely don't match", "why do you have 400 different tubes and crap going everywhere all over your bike? ", and "I actually thought that you were sitting up when I passed you". Needless to say, this was the last race for that particular speedfil. And for several of my spacers. Totally ordered like, 30 of these prints and sent them in our Christmas cards. Or not. Later in 2012. I'm down to a front aero bottle, although I thought that I could get away with the giant one for this race without getting something said to me, so I did-and I got through without having to do the dreaded bottle handoff. Then there's the rest of everything that's going on here. I still wouldn't stay in aero when going over 25mph or so, so I'm back in "half-aero". My position has only been slightly improved over the start of the season. And then there's the helmet and facial expression. I mean, come on. Seriously, just...I have no words. Fast forward to later in 2012, post Placid-camp fittings. Closer to looking like I hold a pro card. I've graduated to a Speedfil between the bars and a single bottle cage. I'm a little more aero, although still not that great. My helmet is still crooked, but not at as severe of an angle. I'm racing in Placid and doing bottle handoffs without getting off the bike. Better, Jennie, better. Almost there. And finally, the picture that inspired Dave's compliment. The QR fits like a glove, so my back is actually practically flat. I've got the hydration setup under control. My flat kit is split up and tucked inconspicuously around my saddle (although, I was not too thrilled to have to touch it on my ride a week later...). The combination of my new Rudy Project helmet and aero braids mean that my helmet is actually on straight. And I'm riding a disc. It only took four years, a variety of excessive hydration setups, multiple fittings, fear of beratements, and (sort of) getting over my fears of wind, downhills, riding in aero, and bottle handoffs to get here (look! I'm riding without my training wheels now!). So I maintain...if there's hope for me, there's hope for everyone! Your descriptions are so entertaining! !! Tough competition in Mt Tremblant huh? Looks like you had a great race especially considering you just won Lake Placid! As bike makers have begun to recognize the demand for women's bikes they need began to build bikes with a pure mathematics tailored to the feminine physique. A laddie's bike tends to own a a lot of pronounced sloping high tube still as being shorter long across the highest to grant women a easier and fewer extended reach to the handlebars click for more info.